Hermkes Bernhard (March 30, 1903 April 17, 1995 in Hamburg) was a German architect and city planner. Hermkes studied architecture in Munich and Berlin. After an internship at the architecture firm of Carl Bensel and Johann Kamps in Hamburg, he completed his studies in Stuttgart with Paul Bonatz. He landed a first job town planning office in Frankfurt / Main where he worked under Ernst May. In 1927 he started his own practice. His first commission was a dormitory for single workers. In 1929 he was appointed for three years as a teacher at the School of Design in Offenbach and from 1933 to 1936 he worked as an independent architect in Frankfurt / Main. In 1935 he started to work for Herbert Rimpl who specialized in industrial construction. With Rimpl he was involved in the planning and construction of the Heinkel works Oranienburg. Later, he joined the office of William Wichtendahl for which he worked on the construction of the Messerschmitt plant in Regensburg. For Wichtendahl he also served as a project manager for the MAN marine engine factory in Hamburg. In 1944, he was drafted into military service. After his return from war in 1945, he opened an office in Hamburg. 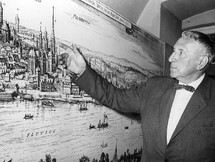 In 1946 and 1947 he was asked to work for Hamburg's city planning committee. As part of the residential housing project "Project Hamburg" he participated in the planning of the Grindelwald skyscrapers. He also acted as a spokesman for the group of architects who were involved in the project. In 1955 he became professor of Industrial Construction at the Technical University Berlin. His winning competition entry for the redesign of the Ernst-Reuter-Platz in Berlin was trend-setting for German reconstruction efforts. The ideal of the loosened up, but well structured city is here put into in practice. Realised at the same time as the neigbouring Hansaviertel, Hermke's design can be seen as a urban counter-proposal to the reconstruction by East Germany on Karl-Marx-Allee (Stalinallee). 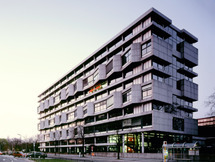 On Ernst-Reuter-Platz Hermkes designed two buildings, the Osram House and the Architecture Faculty TU Berlin although his practice remained in Hamburg.